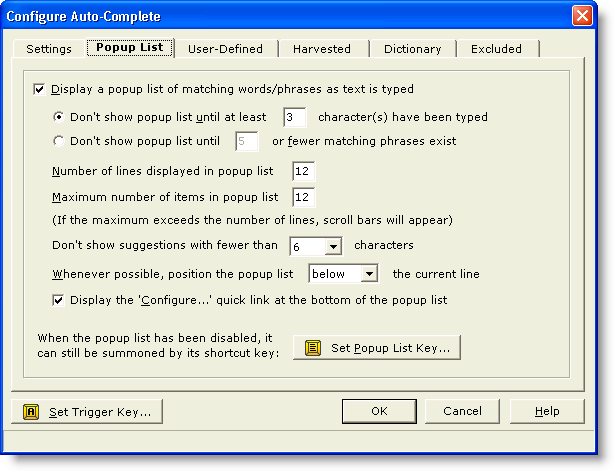 The Popup List tab of the Configure Auto-Complete dialog contains options that relate to the presentation of the popup list of matching words. Use this checkbox to indicate whether or not the popup list box should appear while text is being typed. When disabled, the popup list can still be displayed using the Auto-Complete List command. Use this option if you prefer that the display of the list be determined by the number of characters that have been typed. When this option is used, the popup list will appear as soon as 'n' characters have been typed, provided there are matches available. Use this option if you prefer that the popup list not be shown until the number of matches falls below a certain threshold. When this option is used, display of the popup list will be suppressed until enough typing has occurred to narrow the list to a given number of matching words. This option controls the number of visible entries in the popup list -- ie, the height of the list. This option controls the maximum number of items that will appear in the list. If this values exceed the number of lines, a vertical scroll bar will be added to the list. Use this option to specify the shortest word that should appear in the popup list. Use this option to specify where the popup list will appear in relation to the current line. When the current line is near screen top or screen bottom, the list may need to be moved to keep it on-screen. Use this button to change the key used to force display of the popup list. See the Auto-Complete List command for full details.